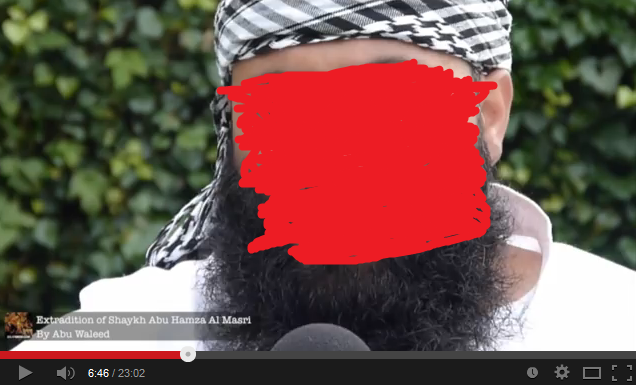 Takfiri Retard: "It is From the Sunnah of the Prophets To Be Ridiculed by the British Media" and Abu Hamza (Former Night-Club Bouncer Turned Takfiri Kharijite and MI5 Collaborator) "Is Like The Prophets Ibrahim and Yusuf"
Below is a video where you see a Salafiyyah-Faking Takfiri by the name of Abu Waleed (from the so-called "Salafi Media UK") speaking out in defence of Abu Hamzah al-Misri (former night-club bouncer turned MI5 collaborator). This same individual makes Takfir of the Salafi scholars and the rulers of the Muslims without exception and uses vile, filthy language to describe the Salafi scholars. These Takfiri Kharijites are remnants of Hizb ut-Tahrir and have a history of adopting different names and labels. The use of the label "Salafi" is fraudulent and they employ it as a veil and cover to deceive other Muslims. As the reader will note, there are some questions which arise from the above remarks such as: What is the definition of the Sunnah this foolish-minded Takfiri is working with such that it is from "the Sunnah of the Prophets" to be "ridiculed and attacked by mainstream British media"? How do former nightclub bouncers turned MI5 informants and collaborators (see here) resemble the Prophets like Ibrahim and Yusuf (alayhimaa as-salaam)? When will we see this Takfiri publish a video in which Takfir of Abu Hamza is established and justified because of dealings with MI5 (security services)? Takfiris like Abu Waleed (of the so-called "Salafi Media UK" or "SMUK") often make Takfir of Muslims with the claim that they have dealings or connections with security services of Western governments. These are just a few of the large number of questions that are raised which indicate the pretentious and contradictory nature of the da'wah of the Takfiri Kharijites. The Prophet (sallallaahu alayhi wasallam) described one of the traits of these people as "they speak with the best speech of creation" and much of what they say (Allaah's law etc.) is received by many as being lofty and noble speech, yet alongside that, the manner of the Prophet (sallallaahu alayhi wasallam) in addressing them was to refer to them as (كلاب النار), "dogs of hellfire." Their ignorance (jahl) coupled by extreme fervor and absence of scholars with them leads them to misguidance (of themselves and others) and they bring about harm and destruction in numerous ways. Help with Arabic Verbs videos.